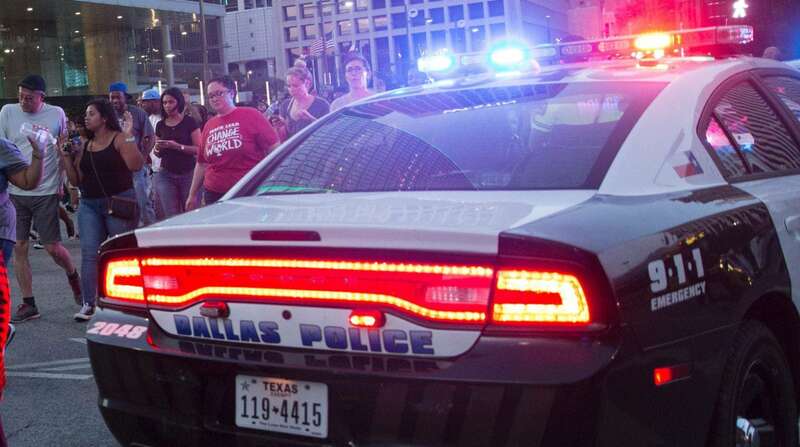 DALLAS—A peaceful protest in downtown Dallas turned deadly on Thursday. Just minutes after a rally in response to recent reports of excessive force and police involved shootings of black men in Louisiana and Minnesota a lone gunmen opened fire killing 5 Dallas police officers and wounding 7 others. The suspect, who died in a El Centro College parking garage, was later identified as Micah Xavier Johnson. Private First Class Johnson was a military veteran who had served in Afghanistan, and told negotiators he was upset about police shootings and wanted to kill white police officers. Reports say that up to four people had been taken in by police for questioning regarding the shooting but later it was determined that Johnson acted alone — and that he had been planning the attack for some time. A Dallas police spokesperson said that Johnson intended to use an incendiary device as well, but after officers and negotiators cornered him in the parking garage the bomb robot defused the device using what is described as a ‘controlled detonation’ which killed Johnson in the process. In the following days there were prayer vigils, moments of silence and calls for peace all over North Texas and across the United States. Public opinions continue to waiver on the motivations of the shooter Dallas Police Chief David Brown calls the acts of Johnson ‘terroristic’ while President Obama calls the actions of mentally unstable army veteran ‘demented’. One thing is certain it has started a serious dialogue in North Texas on the impact of race relations that have even reached as far as the Sunday morning pulpit.